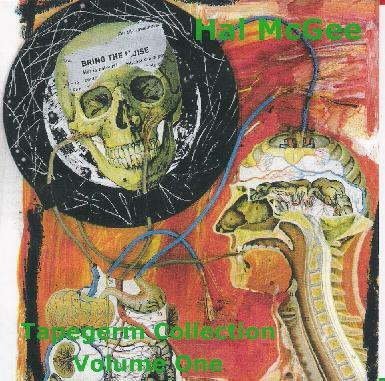 Hal Mcgee - "Tapegerm Collection: Volume One"
When I interviewed Hal McGee almost 4 years ago he expressed mixed feelings about music downloads on the internet (see AI #19). Far from being concerned about copyrights or anything along those lines, it was an ambivalence toward tangible objects (CDs/cassettes) vs. things he just couldn't touch and feel (downloaded mp3's). And though Hal had embraced the internet as a means of promoting and distributing his music, it's only been in recent months that he's climbed aboard the mp3 downloading bandwagon that so many of his fellow veteran hometapers have been on for quite some time now. And Hal couldn't have chosen a better place to make his music available than by becoming a member of the Tapegerm Collective (www.tapegerm.com), a group of musicians and sound artists dedicated to making loop based music. Quoting from the Tapegerm web site: We contribute loops to a pool that can be used by other Tapegerm artists to create new mixes based on these loops and conversely create our own new mixes from the loops provided by other Tapgerm artists. Essentially, we share bits of sound, and the end results of what we do with each others sounds. Personally I think this is an exciting move for Hal, especially now that high speed internet connections are becoming more common. I was, however, surprised to read in a recent email Hal saying that he would be moving away from CD and tape releases and more toward becoming an Internet Audio Artist, though he plans to continue releasing new CDs consisting of collections of his Tapegerm works. I've spent a few paragraphs talking about Hal's transition to internet downloads before getting into the music because I'm very interested in the evolving views and activities of long time homemade musicians, especially as regards the ways they make and distribute their music… hard copy media, internet, and how the two (ideally) work together. Now... if you'll just give me a moment I'll put on the headphones and describe for you the adventures in sound you can either obtain from Hal on CD, or download from his Tapegerm site (even as you read!). Hal has taken loops from a variety of his Tapegerm colleagues to create 12 tracks of freaky electronic, sound and musical fun. The opening track, "He Who Bravely Dares Must Sometimes Risk A Fall", sets the tone for things to come with freaked out space electronics, dissonant free-jazz piano, pulsating drones, warbling theremin, noise waves, and more. But it's also got a rhythmic pace at times, which is very cool along with all the sound collage happenings. Piano has been prevalent on several of Hal's recordings from the past year or so and "Firecrackers and Centipedes" features more avant-jazz-classical piano improv, which of course also includes loads of other sounds and instruments. And among the chaos and layers of sounds and samples I can hear Hal chatting with his wild neighbor, who you will be acquainted with if you check out the Secret Life of Hal McGee DVD (see review this issue). In terms of track titles I love "Call Me Kid Cacophony", as it couldn't be more descriptive, and I know I've used the word cacophony in many a Hal review. But what's interesting as I listen to this collection is how easily discernible all the many pieces are (and there are MANY). Also, when Hal incorporates noise, as he so often does, it's in no way as aggressive and cranium shattering as his earlier recordings. Noise is a key element, but only one of many. And though a part of me enjoys sound-art works that require the listener to wear a Kevlar brain plate, I find this first-among-equals focus on the various sound and instrumentation components to make for a much more relaxed, yet even more challenging listening experience. Among a couple other highlight tracks I'll mention is "This Will Hurt A Bit", which at 11 minutes is the longest track of the set, but is actually pretty darn short for a Hal piece. But this is classic Hal, with conversations (that neighbor again), sound cacophony (that word again), electronic weaponry, and actual music. And "Technopolis" is 10 minutes of completely undiluted electronic space freakiness. Like Tangerine Dream REEEEEALY letting their hair down and going nuts. Awesome!! I don't think a week has gone by lately when Hal hasn't announced a new piece of music available at his Tapegerm site, so bookmark it for a steady stream of new sound-art fun. I guess that also means that Volume Two of the CD collection isn't far off. I'd already been introduced to some of these tracks after having downloaded them from the web. But I was still thrilled to get the CD in the mail with the cool Marcel Herms cover art. Nobody is a bigger advocate than me of making music available on the internet. But I sure do still love that tangible object. For more information you can visit the Hal McGee web site at: http://hometown.aol.com/haltapes1. Download all the music on this CD from Hal's Tapegerm site at: http://www.tapegerm.com/jamroom/bands/314.